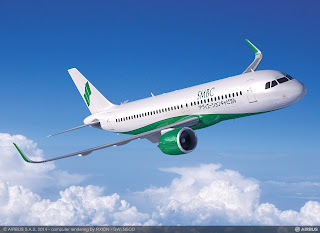 One of the leading aircraft leasing firms SMBC Aviation Capital has signed a firm order for 65 A320neo Family aircraft, made up of 15 A321neo and 50 A320neo the European aircraft manufacturer has confirmed. The deal was finalised at the end of 2018 and will be added to the 2018 year-end figures, Airbus says. With more than 6,500 orders received from over 100 customers since its launch in 2010, the A320neo family has attained around 60% of the market share. With this latest addition, SMBC Aviation Capital ordered a total of 71 aircraft from Airbus during 2018. In addition, the agreement includes an upsizing of 15 A320neo from a pre-existing order to 15 of the largest member of the single-aisle Family – the A321neo – taking SMBC Aviation Capital’s total for the type to 30. With its unbeatable seat mile cost, longer range and wider cabin, the A321neo offers airlines the flexibility to expand their networks using wide-body cabin products on new longer-haul routes which were not previously possible with a single-aisle jetliner. “We are pleased to conclude this transaction which demonstrates our commitment to the future growth and development of this business. Demand for the latest technology aircraft has been strong both from our existing and new customers, hence our decision today to proceed with this order. In the current environment, airlines are seeking more fuel-efficient aircraft. The make-up of our order book positions us very well for the future to deliver on those needs. We have a strong relationship with Airbus and we look forward to working with them to continue to deliver for our customers long into the future,” said Peter Barrett, CEO, SMBC Aviation Capital. The order for 65 is in addition to an earlier agreement for six A320neo made in March, bringing the total number of A320neo Family ordered in 2018 to 71. “As one of the world’s leading aircraft lessors, SMBC Aviation Capital’s repeat order demonstrates its financial astuteness in making wise investments in the A320neo Family. In 2018, the direct leasing market represented over 30% of our 800 worldwide deliveries – as much as Europe and the Americas combined,” said Christian Scherer, Airbus Chief Commercial Officer.